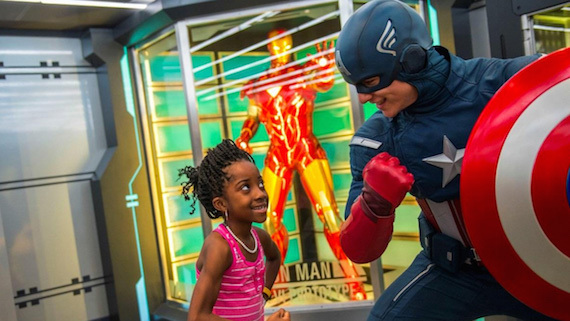 In less than a month, Marvel Day at Sea cruises premiere on select Disney Cruise Line voyages from New York City. As we count down the weeks, we’re revealing more details about the fun you can expect during this epic day-long event aboard the Disney Magic. Of course the fun doesn’t stop there! There will be plenty of opportunities for heroic encounters with some of the mightiest Marvel Super Heroes and Villains, including an interactive show in the Walt Disney Theatre with Doctor Strange. You can learn how to draw heroes like Spider-Man, Captain, Iron Man and Groot and take a quiz to determine the perfect Marvel comic for them! You can also meet and hear behind-the-scenes stories from some of Marvel’s animation, game and publishing insiders. What’s more, this action-packed day features an extraordinary evening deck show like never before. More about that soon! Marvel Day at Sea premieres on select 7- and 8-night Disney Cruise Line sailings from New York this fall, and returns on select 5-night Western Caribbean cruises from Miami in early 2018. Stay tuned as we unveil more details! Stress Free and Hassle Free! FREE Dining Reservation Services (WDW Vacation Packages), Trained Dedicated Agents, and So Much More!